With the extension of the Metav to model, tool and mould construction, the CAM area gains in importance. Correspondingly, almost all important CAM software providers are presenting their current versions at the fair. What they promise is clear: shorter processing times with new modules and more efficient component optimisation. Neither Autodesk nor PTC, Siemens PLM Software nor Dassault Systèmes are on the exhibitors’ list; on the other hand, exhibitors with an emphasis on CAM are all the more numerous in Düsseldorf. The Metav thus offers a very complete market overview in this area. The manufacturers are almost unanimous in focusing on the topics efficiency and shortened processing times, as the following selection of new products shows. DP Technology has just recently presented the new Version 2015 of its Esprit software. The intelligent processing functions in Esprit 2015 offer new five-axis cycles; the new wing-roughing mode, for example, is said to enable complete roughing of wind turbine blades in a single clamping. For reducing processing times, there is the high-speed Profitmilling roughing cycle. The new raw part automation additionally detects in which areas material was removed in previous processing and only processes the part where material is left over. This new function reduces air cuts significantly and shortens the cycle time. Esprit 2015 adopts more information more easily from the CAD system in the CAM environment: sketches, basic profiles of features and curves can now be imported from Catia, Pro-Engineer and NX. With the interface to the machining-cloud, programmers can find the right tool for their processing easily and quickly. 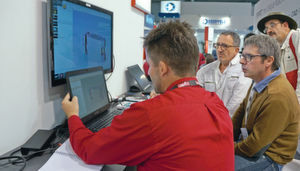 Open Mind presents at the Metav its Hypermill 2016.1 software, which likewise contains a packet of milling strategies optimised for material removal performance. With the “tangential Z-level finishing” from the Maxx Machining packet, up to 90 % of processing time can be saved, the manufacturer tells us. By using conical barrel mills, larger path separations for the same theoretical surface roughness can be realised. The new processing strategy from Open Mind makes use of the extremely large radius of the barrel form, which allows optimum positioning on the surfaces. This way, substantially shorter processing times and top surface qualities are achieved. This innovative strategy is simple to program, highly efficient and process-secure due to collision-checking of tool paths. With the version 2016.1, Open Mind presents the modular performance packet Hypermill Maxx Machining. This offers a selection of optional high-performance strategies for roughing and finishing. The package also includes the previous HPC roughing module, Hypermaxx. Better performance is also promised by the new developments and optimisations in milling/turning. The operating surface has been given an even clearer design for simpler inputting. The new feature is the cutting edge position management, which enables better definition of tool cutting edges and their position. Solid CAM is once again showing its iMachining solution, which promises an outstanding gain in efficiency. Special milling strategies reduce processing times by up to 70 %, at the same time leading to longer tool service lifetimes. The solution is available both as a module for Solidworks and for Inventor.